Click here to go back to the G'vurot. Click here to go forward to the Blessing after the Torah Reading. Do We Really Believe that God Chose Us and Gave Us the Torah? In the blessing before the reading of the Torah, we say that God "chose us from all the peoples and gave us God's Torah." Do we, as Reform Jews, believe that literally? If not, why do we say so in the blessing? Reform Jews, in general, do not believe in the literal transmission of the words of the Torah from God to the Jewish people at a single historical event at Mount Sinai. We see Sinai as a symbol of our ongoing relationship between God and the Jewish people. We believe that the Torah is a work written by human beings who were inspired by God and who wished to share the stories and laws that helped them understand God and God's will. According to this view, the Torah is the product of centuries of Jews who discussed and created laws and legends that drew them closer to God and what it means to live as God wishes us to live. That process has not ended. We are still creating new understandings and interpretations of Torah. Reform Judaism does embrace the idea of the Jewish people being "chosen," but this term does not suggest that the Jewish people are superior to other people or closer to God. Rather, we believe ourselves to be "chosen" in the sense that we have a unique relationship with God that we call a b'rit (a covenant, or agreement) and we live by doing God's mitzvot (commandments). We say that God chose us for the relationship we have with God; other people have their own relationship with God and their own ways of connecting with God. 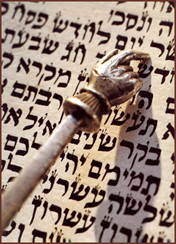 Torah is God's gift to the Jewish people and it is the foundation of our unique relationship with God. In saying this, we are not accepting a supernatural view of the Torah and we are not saying that we are superior to others. Rather, we celebrate the text that is at the heart of our ever developing and reforming relationship with God. That is how we understand the words of the Torah blessing.